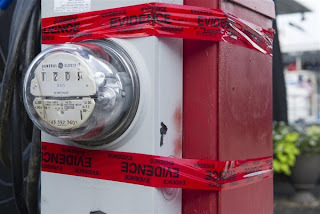 Evidence tape covers an electrical meter near two houseboats at German Creek Marina on Cherokee Lake in Bean Station, Tenn., on Wednesday. One boy died and another was critically injured after an apparent electrocution. Updated at 8:40 p.m.: Three children died -- two in Missouri and one in Tennessee -- after they were shocked by electricity while swimming in lakes, authorities said. In Missouri, 13-year-old Alexandra Anderson and her 8-year-old brother Brayden of Ashland were killed when they were shocked around noon by an unknown source of electricity while swimming near a private dock in the Lake of the Ozarks, KSHB-TV reported. Several adults got the siblings out of the water but couldn't revive them. They were pronounced dead at Lake Regional Hospital in Osage Beach. The Missouri Highway Patrol said investigators were looking at electricity powering lights and a pump that supplies water to a slide children use at the dock, but they had not determined what had caused the electrocution by Wednesday evening. The accident in Tennessee happened near the German Creek Marina on Cherokee Lake in the town of Bean Station. Two boys were swimming in the lake between two house boats when they were shocked, the Grainger County Sheriff's Office said, WBIR-TV reported. The scene at German Creek Marina on Cherokee Lake in Bean Station, Tenn., on Wednesday after a boy died and another was critically injured in an apparent electrocution. Both boys, whose names were not released, were originally reported dead but Sheriff Scott Layel said one child was revived on a medical helicopter flight. The sheriff's department said several other people were taken to the hospital in Morristown to be checked out because bystanders trying to rescue the boys were shocked as well. The marina was evacuated as a precaution. Authorities were searching for the source of the electric current. Layel told the Knoxville News Sentinel that wiring in the bottom of one of the houseboats might be the issue behind the shocks. It was uncertain whether the boys were shocked in the water or when they touched the metal ladder of one of the houseboats, Layel said.